The Phantom Regiment is proud to present the 9th annual NIU Concert Band Festival in conjunction with the NIU Huskie Marching Band. Your high school or middle school* band will have the opportunity to perform in the beautiful Boutell Memorial Concert hall on the campus of Northern Illinois University. The festival is a non-competitive educational event in a welcoming environment. Register online here. (* Please note: there are only a limited number of middle school spots available every year). This is a beautiful concert hall to have your band perform in, while also receiving a studio quality recording using the state of the art equipment. Being able to perform on a stage like this will be beneficial as well as exciting for your students. An added bonus is a special performance by the Northern Illinois University Wind Symphony under the direction of Dr. Thomas Bough. Your students will be able to see and hear one of the best ensembles in northern Illinois. The wind symphony will perform at Noon on each day of the festival. This is a free event, and parents and fans are encouraged to attend. Parking can be difficult due to the location of the concert hall, so we recommend that you arrive early so that you don’t miss the band’s performance. Performance time slots on respective days are based on date entry form is received. If you need a special time slot to accommodate other activities that day, please let us know so that we may try to accommodate your needs. ALSO, bands that participate in the Red & Black Fall Classic the previous September may receive a $100 discount (email bands@regiment.org before registering). As an added educational bonus, there is a special conductor cam that will record your conducting of the concert. Each band will have three 20-minute blocks: warm-up; perform on stage; and clinic, with ten minutes to transition between each block. The different rooms are all located inside the NIU music building. The clinicians will record comments during the concert, and commentary will be provided to download after the performance. Then a live clinic will take place in another room. NIU will provide the following in the concert hall: 4 timpani; marimba; xylophone; vibraphone; orchestra bells; chimes; 4 concert toms; concert bass drum; gong and piano. Please note: these will also be available in the warm-up room & clinic room when possible. 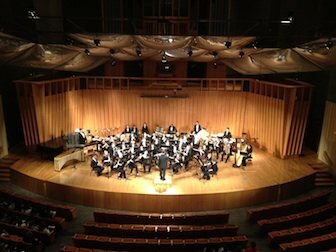 Bands are also encouraged to come early or stay later to observe other performances from the bands participating in the festival, especially the NIU Wind Symphony. Previous clinicians have included: Richard Holly, former Dean of the NIU College of Visual and Performing Arts; Dr. Mark Ponzo, NIU Professor of Trumpet; Dr. Thomas Bough, NIU Director of Athletic Bands, Steve Squires, Professor of Conducting, Roosevelt University; Lt. Col. Bryan Miller, The Air National Guard Band of the Midwest; Christian Carichner, Assistant Director of Bands and Instructor of Tuba and Euphonium at Iowa State University; Dr. Christopher Hughes, Director of Instrumental Studies and Associate Professor of Music at New Mexico State University;Dr. Richard Mark Heidel, The University of Iowa; Dr. Galen Karriker, The University of Akron; Lt. Col. Michael Willen, United States Air Force Band of Mid-America; Dr. Timothy Shade, Director of Bands at Wichita State University; and James P. Stephens, Jr., Director of Advocacy and Educational Resources at Music for All, Inc., Dr. Jeffrey Malecki, Director of Bands & Music Education at University of San Diego, Dr. Michael W. Mapp, Director of Bands at New Mexico State University. The entry fee is $300.00. We do accept school purchase orders, or you can use Visa, MasterCard and pay online. If you prefer to mail a check, you can mail it in with the registration form. You can print out your registration form after you have submitted the online form for receipt purposes, or to mail in with your check. If you have any questions, feel free to contact us at 815-261-1956 or bands@regiment.org. We look forward to seeing you!